Congress President and UPA Chairperson Sonia Gandhi while addressing a public rally in the Konkan area of Maharashtra acknowledged the services of the people in the region, especially the people working in the defence services. “I learnt that there a number of Ex-servicemen in the region and I am happy to inform them that the Congress-led UPA Government at the Centre has taken decision to increase their pension”. Congress President and UPA Chairperson Sonia Gandhi said the people in the country are fed up with the opportunistic and negative politics. “The people want transparency in politics,” said Sonia Gandhi. “I therefore always urge my colleagues in the Congress party that we should not give any hollow promises to the people,” said the Congress President. “At present we have a Congress-led UPA Government at the Centre and it has been putting in all its sincere efforts to find solutions to the problems of the poor and underprivileged” said Sonia Gandhi, the Congress President while addressing a public rally in Maharashtra. “The earlier BJP led NDA Government made a lot of empty promises to the people but delivered nothing. Now our Congress-led Government has been trying to implement policies as we had promised in the manifesto” informed Sonia Gandhi. Congress President and UPA Chairperson Sonia Gandhi during her two-day visit to her Lok Sabha constituency Raebareli said that the UPA Government has taken a number of positive steps to provide education facilities to maximum people. Sonia Gandhi further said that the Human Resource Development Ministry has taken an initiative to set up a Girl’s degree college Rae Bareli. "State government has also shown positive stand in giving land. As soon as land is provided necessary steps would be taken immediately and the college will be named after Indira Gandhi," said the UPA Chairperson. On road-links, Sonia Gandhi added "Work on widening Rae Bareli-Allahabad road would be started soon at a cost of Rs 300 crore. The UPA government has given approval for national highway projects at a cost of Rs 1,800 crore." "This is my request to Road Transport and Highways Minister C P Joshi that all these projects should be completed at the earliest and in a time-bound manner with quality so that people could benefit during Kumbh to be organised in Allahabad next year," said Sonia Gandhi. This is the first visit of Sonia Gandhi to Rae Bareli after the state assembly elections. Sonia said that she was feeling good after meeting people of Rae Bareli after a long time. "I am sorry that I could come here earlier due to some personal reasons," she said striking an emotional chord with the people of her constituency. She also attended a Roza Iftaar organised by the Congress workers. Prime Minister Manmohan Singh, Congress President and UPA chairperson Sonia Gandhi will visit violence hit Assam on Saturday, to take stock of the situation there. They are scheduled to visit Kokrajhar, the epicentre of the ethnic clashes. After a meeting with the authorities, the PM and Sonia Gandhi will visit two relief camps in Kokrajhar. Their visit comes after more than 8 days of clashes between two communities that has seen more than 40 people dead. More than 4 lakh people are now living in relief camps in the affected areas. Central paramilitary forces are now out in full force in the state. Home Minister P Chidambaram is also likely to visit ethnic clash-hit areas in Assam on Monday to review the security measures there and the steps taken for relief and rehabilitation of affected people. Congress President and UPA Chairperson Sonia Gandhi urged for better implementation of flagship Congress-led UPA schemes in her parliamentary constituency. She was attending a review meeting of the development projects in Raebareli. Regarding the Mahatma Gandhi National Rural Employment Guarantee Scheme (MNREGS), among others, Sonia Gandhi stressed on the need to increase the participation of women and physically challenged persons in MNREGS. She also met representatives of the district Congress committee, NSUI, Youth Congress, Seva Dal, Mahila Congress and PCC members representing Rae Bareli to get complete feedback on the status of the developmental programmes in her constituency. The Congress President also met a interacted with party workers and residents of the district, where she heard their grievances. Sonia Gandhi also reiterated her commitment to work for the development of Rae Bareli. 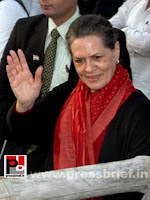 City Congress in-charge of Rae Bareli, Raghavendra Pratap Singh, said, " People were happy to see Sonia Ji. The people of Rae Bareli also asked her to visit more often, and give them special time slots to meet her even in Delhi." Meeting the public and party workers for over three hours on Friday morning, the Congress President, also discussed various organizational matters with the party workers. On Thursday, Sonia Gandhi also laid the foundation stone of a four-lane Lucknow-Rae Bareli section of a 70-km road and two-lane Rae Bareli-Allahabad section of the 106 km National Highway-24B. She also announced that a Kendriya Vidyalaya would be set up in Rae Bareli's Bachchrawan area. The Congress-led UPA Government’s Mahatma Gandhi NREGA policy has given a new hope for the poor people in the villages, said Congress President and UPA Chairperson Sonia Gandhi while addressing a Congress rally in Maharashtra’s Konkan region. The policy ensures a minimum of 100 days of jobs to every poor in the villages, informed Sonia Gandhi. The Congress-led Central government got the inspiration for the scheme from Maharashtra, said the Congress leader. “The Congress-led UPA Government, following the model of Maharashtra government, implemented the Right To Information Act (RTI)” informed Congress President and UPA Chairperson Sonia Gandhi while addressing a Congress rally in Maharashtra’s Konkan region. The policy empowers the citizen to get information regarding all the government polices and thus ensures transparency in the administration, said the Congress leader. Sonia Gandhi talks about the women-welfare policies of the Congress-led UPA Govt. Congress President and UPA Chairperson Sonia Gandhi informed that the Congress-led UPA Government at the Centre has made a law to give equal rights to the women in the family property. While addressing a public rally in Maharashtra’s Konkan region, the Congress President also informed about the laws to tackle the atrocities against the women including the domestic violence. Congress President and UPA chairperson Sonia Gandhi, who is on two day visit to her parliamentary constituency Raebareli said that society and the nation can move forward only if maximum people are educated. She was addressing the function to lay the foundation stone for the project of strengthening and broadening works of two roads on the National Highway 24 B in Indira Gandhi Auditorium at Firoz Gandhi PG College, Raebareli. This is Sonia Gandhi's first visit to the state after the recently held UP Assembly polls. “There is no end for duties and responsibilities in our life and in the similar manner there is no end for the efforts for development of our country. The moment we accomplish a scheme, we can always see new avenues for development. We see new possibilities at each turn. It has been our sincere efforts to design new policies and schemes for the welfare of the people and to make the lives of the people more comfortable,” added the UPA Chairperson. “The UPA Government at the Centre has implemented a number of welfare schemes aiming for the welfare of every section of our society and many people are reaping the benefits too. I think that society and the nation can move forward only if maximum people are educated. Education is the key for a better and bright future. The UPA Government at the Centre, has therefore, taken some strong steps in this direction. Approval has been given for one model school in every block and 75 percent of the cost is being given by the UPA government. In Uttar Pradesh money has been provided for 148 schools. In Raebareli district too, the works are in progress for three model schools and the permission has been given for a Central school in Bachcharawa. Permission has been given to start all primary sections at the Central School in Gora Bazar which would be very much beneficial for the children in Raebareli” continued Sonia Gandhi. The MP from Raebareli further said that Rae Bareli being the "karmbhoomi" of late Prime Minister Indira Gandhi, it was her wish that a girls' degree college should be build in her memory. “Raebareli was Indira Ji’s karmbhoomi. It has been my dream since long to build a Mahila Mahavidyalay in the memory of Indira Gandhi. I am very happy to inform you that Human Resource and Development Ministry has already taken initiave for a Mahila Mahavidyalay here. State government has also shown positive stand in giving land. As soon as land is provided necessary steps would be taken immediately to make this project a reality and the college will be named after Indira Gandhi”, she said. “Further Sharda Sahayak and Sarayoo canal projects will be given the status of the national projects. The rail project works are also going in full swing. Our sincere efforts are to bring in more development projects in this region. I promise that I will keep trying for the progress of Raebareli and I will continue my fight in this regard,” informed Sonia Gandhi to the cheering crowd. Sonia Gandhi expressed hope that all these projects would be completed within the scheduled time so that people can avail the benefits as fast as possible. Later in the day, the Congress President will take part in Roza Iftar at the Asia Utsav lawns. Congress President Sonia Gandhi reached on a two-day visit to her parliamentary constituency Rae Bareli on Thursday. On the first day, Sonia Gandhi laid the foundation stone for the project of strengthening and broadening works of two roads on the National Highway 24 B during a function in Indira Gandhi Auditorium at Firoz Gandhi PG College. Congress President and UPA Chairperson Sonia Gandhi informed that the Congress took initiative to form a coalition government at the Centre with an objective to work for the welfare of the people and development of the country. It is not an opportunistic alliance but is a combination to implement policies to ensure progress in the country, added Sonia Gandhi. “Congress always fought to protect the unity and integrity of the country, before and after independence”, said Congress President and UPA Chairperson Sonia Gandhi. While speaking at a public rally in Maharashtra, the Congress President underlined that many Congress leaders had sacrificed their lives for the nation. Sonia Gandhi also thanked the people for their overwhelming support to the Congress. Congress President and UPA chairperson Sonia Gandhi paid her tribute to veteran film star Rajesh Khanna who had died after a prolonged illness in Mumbai. The Congress President expressed her deep sorrow on the demise of Bollywood's first superstar. A statement by the Congress said Gandhi has expressed her heartfelt condolences to the bereaved family of Khanna, also a former party parliamentarian. "Congress president Sonia Gandhi has expressed her deep sorrow and grief on the demise of Shri Rajesh Khanna," the statement said. Rajesh Khanna, Bollywood's first superstar, passed away on last Wednesday following prolonged illness. He was admitted to hospital on several occasions. Several political leaders and other celebrities also paid tributes to Rajesh Khanna. The democratization process of Youth Congress and NSUI is one on going process. Immediate results might not impress the political analysts but this long term and well meant initiative undertaken by RahulGandhi is bound to redefine Indian Politics. It's going to improve the quality of polity in India. Have patience, results would be very positive. Joining mainstream politics doesn't mean abandoning the drive undertaken. In UP, he fought from the front and took the responsibility very gracefully. It was the collective failure of the party and the strategists. Leader is someone who doesn't shy after falling from horse's back, rather he takes the horse in command and continues fighting. He is a leader who has started his journey well and time will tell what all hidden talents he has. Unfortunately we start judging people too fast. He is one of the rare leaders who understands the aspirations of rural and urban India. In his limited capacity has always championed their cause. When Rahul Gandhi became MP from Amethi he believed his primary concern was focusing on his constituency. When he was elected General Secretary he started focusing on Youth Congress and NSUI as well. He took his assignments seriously and moved in a systematic manner. He focused on his job and worked hard. These are certain qualities which a reluctant politician can't inherit. Never doubt Rahul Gandhi's intentions. For him the real challenge is how to fix the leakages in almost all the welfare schemes meant for the most humble person of our society. Be it the BPL card, Indira Awaas Yojana or the minimum wage in MGNREGA. And here comes the UID card and his keen interest in its speedy implementation at the grass roots. In this age of fast food it's quite convenient for Urban India to become self centered. In this endeavor one tends to forget that every one of us have our roots in our villages and in our rise and shine their contribution has been most crucial. But why do we shy when it's the pay back time? And if one young leader starts working in that direction rather than appreciating it this urban lot starts finding political motives. It's a disservice towards our nation to put question mark on the long term objectives initiated by Rahul Gandhi. The bridge he is trying to strengthen between the villages and our towns is a form of pay- back. They deserve it more than any one else. The would-be global power that is India would never shine if it fails to take along the less privileged yet content Aam Admi along. Rahul Gandhi is moving in the right direction. Time will prove his purity, clarity and vision. He is the dark horse of Indian politics. Congress President and UPA Chairperson Sonia Gandhi while addressing a public rally in Andhra Pradesh said that only Congress is sincere to serve the people. The opposition - TDP, BJP – have been trying to fool the people with blind promises and claims. But the people of the state will realize realize the fact and would support Congress, hoped the Congress leader. Congress President and UPA Chairperson Sonia Gandhi while addressing a public rally in Andhra Pradesh said that the non-Congress government under TDP never bothered about the people in the state. The people in the state were forced to migrate to other cities for jobs. There were no sufficient jobs available under the non-congress rule” argued the Congress President. Never doubt Rahul Gandhi's intentions. For him the real challenge is how to fix the leakages in almost all the welfare schemes meant for the most humble person of our society. Be it the BPL card, India Aways Young or the minimum wage in MGREGA. And here comes the UID card and his keen interest in it's speedy implementation at the grass roots. And if one young leader starts working in that direction rather than appreciating it this urban lot starts finding political motives. It's a disservice towards our nation to put question mark on the long term objectives initiated by Rahul Gandhi. The bridge he is trying to strengthen between the villages and our towns is a form of pay back. They deserve it more than any one else. The would be global power that is India would never shine if it fails to take along the less privileged yet content Aam Aadmi along. Rahul Gandhi is moving in this direction. Time will prove his purity, clarity and vision. He is the dark horse of Indian politics. “The people were suffering when the non-Congress parties were ruling the state as well as the Centre” said Sonia Gandhi, the Congress President and UPA Chairperson. While addressing a public rally in Andhra Pradesh Sonia Gandhi said that the non-Congress governments never bothered about the people in the state. “The people in the state want concrete actions. Mere statements will not work,” said Sonia Gandhi, the Congress President and UPA Chairperson. While addressing a public rally in Andhra Pradesh, Sonia Gandhi said that the non-Congress governments never bothered about the people in the state and no effective measures were taken by them for the welfare of the people. “The BJP led government which ruled the country did nothing for the welfare of the people especially the poor in the country” said Congress President Sonia Gandhi in Andhra Pradesh. It was Congress who brought in policies for the welfare of the poor, women, backwards and the farmers in the country. We witnessed tremendous development under Indira Gandhi and Rajiv Gandhi, especially in the field of technology, said the Congress leader. “The inflation was on the rise and the threat of terrorism had at its maximum when BJP led NDA was in power at the Centre”, said Congress President Sonia Gandhi. While addressing a public rally in Andhra Pradesh Sonia Gandhi said that the NDA even sold out the PSUs, which are the national assets. “Congress built the establishments, and the BJP sold it out” alleged the Congress leader. Congress President and UPA Chairperson Sonia Gandhi urged the people of Assam to use the strength of votes so that opportunistic people and negative politics will not dominate the affairs in the state. “During elections, these people and parties come to the people with different arguments, claims and promises. But the people should realize their real intentions and should use the power of vote to defeat these divisive ideologies” said Sonia Gandhi while addressing a public rally in Assam. Prime Minister Manmohan Singh, Congress President Sonia Gandhi and United Progressive Alliance (UPA) presidential candidate Pranab Mukherjee cast their votes voted to elect India's new President. Congress General Secretary Rahul Gandhi also cast his vote. The leaders waved towards a battery of reporters covering the election of India's 13th president. Congress President and UPA Chairperson Sonia Gandhi said that the Congress always believed in secularism and always stood to protect the secular credentials in the country. While addressing a Congress rally in West Bengal the Congress President slammed the opportunistic alliance of the BJP-led NDA and said that they never bothered about the people especially the aam aadmi and the poor. Congress President and UPA Chairperson Sonia Gandhi said that to ensure the welfare of the people and development of the country, the Congress-led UPA had made a Common Minimum Programme. While addressing a Congress rally in West Bengal the Congress President said that the UPA Government at Centre has been putting its sincere efforts to frame policies and schemes to ensure the upliftment of the poor and downtrodden. “The Congress-led UPA government at the Centre has made a separate ministry for the minority welfare. This is the first time in the history of our country” said Congress President and UPA Chairperson Sonia Gandhi. While addressing a Congress rally in West Bengal the Congress President said that the UPA Government at Centre has been putting its sincere efforts to frame policies and schemes to ensure the upliftment of the poor and downtrodden. Sonia Gandhi also explained about various measures taken by the Congress-led government at the Centre for the welfare of minorities. Congress President and UPA Chairperson Sonia Gandhi said that our country cannot move forward without ensuring security for the women. The Congress-led UPA Government realizes this fact and has been making policies to empower the women, claimed Sonia Gandhi. The Congress President was addressing a Congress rally in West Bengal. Sonia Gandhi also talked about the need to address the issues of the youth in the country. The Congress leader also talked about the various welfare schemes and policies of the Congress-led Central government. “The welfare of the youth in the country has always been the prime concern of the Congress-led UPA Government at the Centre”, said Congress President and UPA Chairperson Sonia Gandhi. While addressing a public rally in West Bengal, the Congress President informed that the Congress-led Central government implemented the Mahatma Gandhi NREGA scheme to guarantee jobs to the poor people in the villages. “The scheme ensures a minimum of 100 days of jobs to the youth in the villages’ added Sonia Gandhi. Congress President and UPA Chairperson Sonia Gandhi expressed her concerns over the bad law and order situation in West Bengal. She also said that a number of people including the Congress workers were killed in different political clashes in the state. Sonia Gandhi also hinted that the Left front Government in the state did not implement the Central policies like MGNREGA effectively. Congress President and UPA Chairperson Sonia Gandhi expressed her concerns over the difficulties being faced by the farmers in West Bengal. The Congress-led UPA Government at the Centre has been putting in its sincere efforts to frame policies to find solutions to the poor farmers. The state government also should take initiatives in this regard, said Sonia Gandhi. Sonia Gandhi also hinted that the Left front Government in the state did not implement the Central policies like MGNREGA effectively. Congress President and UPA Chairperson Sonia Gandhi claimed that the development we see now in West Bengal are the results of the policies by the earlier Congress Government in the state as well as at the Centre. She also expressed her concerns over the difficulties being faced by the farmers in West Bengal. The Congress-led UPA Government at the Centre has been putting in its sincere efforts to frame policies to find solutions to the poor farmers. The state government also should take initiatives in this regard, said Sonia Gandhi. While talking at the CWC meeting in New Delhi recently, Congress President Sonia Gandhi had said that corruption charges against Prime Minister Manmohan Singh are part of a "conspiracy". The UPA Chairperson slammed the opposition parties and civil society activists for making "baseless charges" against the government. Sonia Gandhi said the party would have to "fight fiercely" against such allegations. There were allegations that Dr Singh and 14 cabinet ministers should be investigated after a draft report by government auditors said India lost $210bn by selling coalfields too cheaply. 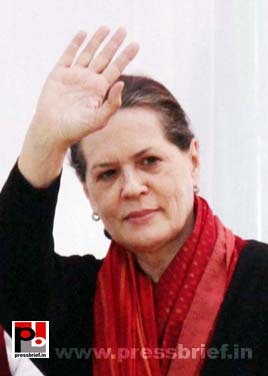 Sonia Gandhi’s comments were made at a crucial meeting of the senior party leaders and government ministers on Monday. Sonia Gandhi also referred to the economic challenges facing the country. "The whole world is passing through a difficult phase and we have to face it and we are facing it," said the Congress President. “The people in Gujarat are facing insecurity and they are living in danger” said Congress President and UPA Chairperson Sonia Gandhi while speaking at a rally in Gujarat. “The policies of the state government are anti-poor and no one in Gujarat feels secure under the present regime”, alleged the Congress leader. Sonia Gandhi slammed BJP for its wrong policies and its stance on terrorism. Congress President and UPA Chairperson Sonia Gandhi blasted the BJP for its double-speak on terrorism. ‘The BJP talks loud on corruption, but it was under its regime the terrorists attacked Akshardham and even the Parliament. Further, it was during their rule, the Union External Minister escorted a terrorist to Afghanistan and released him,” said the Congress leader exposing the real face of the BJP. “Gandhi Ji, Nehru Ji and Sardar Patel Ji gave full respects to the farmers in the country and called them ‘anna dada’ but the Gujarat Government treats the farmers as criminals”, said Congress President and UPA Chairperson Sonia Gandhi in Gujarat. While addressing a rally she said that the Gujarat Government labels the farmers who fight for their rights as criminals. Sonia Gandhi alleged that the state government is not able to make use of the welfare policies of the Congress-led Central government properly for the benefits of the people. Congress President and UPA Chairperson Sonia Gandhi while speaking at a rally in Gujarat claimed that her party Congress is always committed to ensure the welfare of the all sections of the people including the farmers. All the benefits enjoyed by the farmers in the country today are the results of the long-vision policies of the Congress, said Sonia Gandhi. But the BJP is never bothered about the difficulties of the poor farmers, she alleged. Congress President and UPA Chairperson Sonia Gandhi asserted that her party Congress is always committed to serve the society and the poor in the country. The Congress had drafted the policy for the welfare of Adivasis, but when BJP came to power they did not consider it necessary to get the bill passed. Sonia Gandhi asked the BJP why it did not take measures to pass the bill if it is really interested to protect the interests of Adivasis. Congress President and UPA Chairperson Sonia Gandhi, while speaking at a rally in Gujarat, said that serving the society and the poor people have always been the mission of the Congress Party. She added that the integrity and unity of our country has always been the concern for the Congress. She also recalled the sacrifice of great national leaders like Indira Gandhi and Rajiv Gandhi for protecting the integrity of the Nation. Congress President and UPA Chairperson Sonia Gandhi, while speaking at a rally in Gujarat, said that the integrity and unity of our country has always been the concern for the Congress. She also recalled the sacrifice of great national leaders like Indira Gandhi and Rajiv Gandhi for protecting the integrity of the Nation. 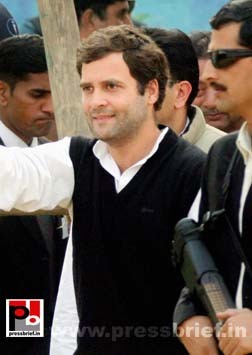 The ongoing discussion after Salman Khurshid’s comments on Rahul Gandhi is baseless. The opposition is using this opportunity to tarnish the image of Congress especially, the young Congress General Secretary, Rahul Gandhi. If we analyse various interventions of Rahul Gandhi, one can easily find out that he has got modern vision, he has clarity in his mission and he is clear about his ideas. He understands the importance of democracy and he always believed that if the country is to develop the democracy should reach the grass root. That is what Rahul Gandhi did in the Youth Congress and NSUI. Without seeing all these facts in front of us, some political personalities level baseless allegations and call him directionless. It is unwarranted, ridiculous and totally uncalled for. The opposition is using the reported comments made by Union Minister Salman Khurshid in a wrong way to defame Congress General Secretary Rahul Gandhi. The fact is that these people are closing their eyes towards the reality. We can recollect some of the comments made by the Congress General Secretary Rahul Gandhi while addressing the convocation function at IIIT, Amethi. “We started as a nation of poor people as everybody of us was poor. And today, what I have been saying for a quite long time, there are now two Indias. There is one India which is connected, the prosperous India.. and most of us come from that India.. from Delhi, Bangalore, Lucknow, Kolkata.. all these cities are connected, rich and are moving forward and fast. And it is everyone’s duty to take the unconnected India and connect it to the connected part”. This simple sentence clearly shows his clarity about development. So before someone calls his directionless, it would be better they just go back and understand the facts. Some people, mainly in the opposition, is using the opportunity of the ongoing controversy over the comments made by Union Minister Salman Khurshid to target Congress General Secretary Rahul Gandhi. They are not ashamed to call him directionless. But it would be better for him to just go through his political life to realise the fact. Rahul Gandhi is a leader who delivers. Further he has got clear vision and ideas about the life and the Nation. Just to have a glimpse of his vision one can just recall a comment made by Rahul Gandhi during his address at IIIT Amethi. “Knowledge is created by the destruction of knowledge. There were a lot of things in my mind which I thought were correct were destroyed now and I no more believe in those. Those were replaced by new ideas and I am absolutely certain that some of the ideas which I have today may get destroyed tomorrow. And that is a good thing because none of us are god. We do not have eternal knowledge or eternal understanding”. The leaders of some of the opposition parties are using the recent comments made by Union Minister Salman Khurshid in a negative manner to defame the young congress General Secretary Rahul Gandhi. They use the chance to question Rahul Gandhi’s leadership and vision. But if we just go through his various interventions and speeches, we can very well understand that Rahul Gandhi is a matured leader with clarity in his ideas. Let us just recall some comments made by the Congress MP from Amethi during his address at IIIT, in his parliamentary constituency. “…… to gather knowledge, go towards the problem. That is what I did experience. When I go to a poor person’s house and asks about the things he does, I get the knowledge. So I realize that he knows better than me about his nature of job. So it is very important to respect the person’s views who is much closer to the problem…. There is a feeling among the politicians in India that they are the most knowledgeable persons. Understanding the knowledge is built on the destruction of the knowledge. In our ancient scripts there is a trinity- creator, preserver and destroyer. There is a reason behind it. You cannot have creation without destruction. You cannot have destruction without creation. And you cannot have either of these two without preservation. The Congress President Sonia Gandhi while addressing the MGNREGA Sammelan said the act has given a chance to the Aam Aadmi to articulate his needs, negotiate his rights, seek employment at his own will and live a life of self-respect and dignity. It helped to empower the poor in the villages and also could provide a feeling of social security. Sonia Gandhi also expressed happiness for the fact that the major beneficiaries of this scheme were women. The Congress President Sonia Gandhi while addressing the MGNREGA Sammelan said the policy by the Congress-led UPA Government at the Centre has given a chance to the poor people in the villages to empower themselves. The policy gave aam aadmi to articulate his needs, negotiate his rights, seek employment at his own will and live a life of self-respect and dignity, said Sonia Gandhi. It helped to empower the poor in the villages and also could provide a feeling of social security. Sonia Gandhi also expressed happiness for the fact that the major beneficiaries of this scheme were women. Congress President and UPA Chairperson Sonia Gandhi expressed her concerns over some of the short comings reported, in the implementation of the Congress-led UPA’s flagship programme Mahatma Gandhi NREGA. She cited delays in wage payments, less wage payments, less coverage, bogus job cards, lack of receipts of acknowledgments, diversion of funds etc. as some of the challenges in the implementation of the program. It is expected that the deliberations and the sharing of experiences by the practitioners and implementing agencies during the Mahatma Gandhi NREGA Sammelan would go a long way in consolidating the gains made under the Scheme so far and in the process reaching out more effectively to the aam aadmi. Congress President and UPA Chairperson Sonia Gandhi lauded the progress made under the Mahatma Gandhi NREGA and said it is a reflection of Government’s commitment to the rural poor. Sonia Gandhi said that this is the time to have a proper review of the flag ship programme so that we can further strengthen it. The Congress President said the act has given a chance to the Aam Aadmi to articulate his needs, negotiate his rights, seek employment at his own will and live a life of self-respect and dignity. It helped to empower the poor in the villages and also could provide a feeling of social security. Sonia Gandhi also expressed happiness for the fact that the major beneficiaries of this scheme were women. Sonia Gandhi added that the policy by the Congress-led UPA Government at the Centre has given a chance to the poor people in the villages to empower themselves. The policy gave aam aadmi to articulate his needs, negotiate his rights, seek employment at his own will and live a life of self-respect and dignity, said Sonia Gandhi. It helped to empower the poor in the villages and also could provide a feeling of social security. Sonia Gandhi also expressed happiness for the fact that the major beneficiaries of this scheme were women. The Congress President also expressed her concerns over some of the short comings reported, in the implementation of the Congress-led UPA’s flagship programme Mahatma Gandhi NREGA. She cited delays in wage payments, less wage payments, less coverage, bogus job cards, lack of receipts of acknowledgments, diversion of funds etc. as some of the challenges in the implementation of the program. It is expected that the deliberations and the sharing of experiences by the practitioners and implementing agencies would go a long way in consolidating the gains made under the Scheme so far and in the process reaching out more effectively to the aam aadmi. Congress General Secretary Rahul Gandhi, who was in Himachal Pradesh on a two-day visit, urged the Congress leaders and workers in Himachal Pradesh to put up a united show in the state. The Congress General Secretary told workers and leaders that recommendations of block, district and state Congress committees would be given weightage while allocating tickets. "Paratroopers will not be accommodated," Rahul Gandhi said. For Congress President and UPA Chairperson, politics means service. 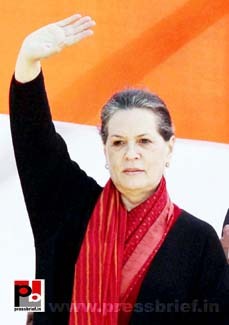 As UPA Chairperson, Sonia Gandhi was instrumental in framing a Common Minimum Program when UPA was formed the Government. She knew very well how to run a coalition Government better. As chairperson of the National Advisory Committee and the UPA chairperson, she played an important role in making the National Rural Employment Guarantee Scheme and the Right to Information Act into law. She also actively involved in framing policies like Mid-day meal scheme for the school children, Sarva Siksha Abhiyan, Anti Communalism Bill and Food security Bill. Sonia Gandhi is also keen to get the Women Reservation Bill implemented. For Congress President and UPA Chairperson Sonia Gandhi politics means service and she always considered that politics is not power. Sonia Gandhi is always concerned for all section of the people including aam aadmi, tribals and backwards. She always wanted to empower the adivasis and all other belonging to the tribal communities. The welfare of aam aadmi has always been her mission. As the UPA chairperson Sonia Gandhi was instrumental in framing the policies like MNREGA, RTE, RTI and her next target is to get the Right to Food Bill is passed. All India Congress Committee (AICC) general secretary Rahul Gandhi will start his two-day tour of Kullu district on Monday, ahead of the Himachal Pradesh assembly elections in early 2013, to strengthen the Congress in the state ahead of assembly elections in the state. 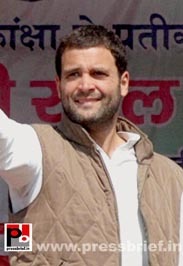 Rahul Gandhi would reach Kullu at 12 noon on Monday and hold personal meetings with Congress MPs, MLAs, Youth Congress/AICC members, ex-members, campaign committee members, other Congress leaders and members and discuss the various problems being faced by party in the state. Virbhadra Singh, Anand Shama, Kaul Singh Thakur, Raj Babbar and other Congress veterans would be present in the meetings which are being organized at various venues in Kullu. Congress President Sonia Gandhi along with Prime Minister Manmohan Singh visited the flood hit state of Assam on Monday. Both Sonia Gandhi and the PM made an aerial survey by helicopter of Majuli island, Jorhat, Sibsagar, Lakhimpur and Dhemaji districts, which were among the worst-affected in the floods. Congress President Sonia Gandhi visited the flood-hit areas in Assam along with Prime Minister Manmohan Singh on Monday. Both Sonia Gandhi and the PM made an aerial survey by helicopter of Majuli island, Jorhat, Sibsagar, Lakhimpur and Dhemaji districts, the most affected areas in the floods. They also are set to survey the Kaziranga National Park, which has been completely submerged by flood waters. Congress President Sonia Gandhi and Prime Minister Manmohan Singh visited the flood hit state of Assam on Monday. Both Sonia Gandhi and the PM made an aerial survey by helicopter of Majuli island, Jorhat, Sibsagar, Lakhimpur and Dhemaji districts, which were among the worst-affected in the floods. They also will be visiting the Kaziranga National Park, which has been completely submerged by flood waters. Earlier, Dr Singh and Sonia Gandhi reached Jorhat’s Rowriah airport from New Delhi by a special flight at around 11:00 a.m.
Later in the day, the two leaders would reach Guwahati and discuss the latest situation with ministers and officials. Dr Singh and Sonia Gandhi are scheduled to leave for New Delhi from Guwahati in the afternoon. Floods and landslides have left 77 people dead and six were reportedly missing in Assam. All 27 districts are under water. The Brahmaputra and the Kapili river are flowing above the danger mark at various places. About 20 lakh people have been displaced in the flood, the worst in more than a decade. Congress President Sonia Gandhi and Prime Minister Manmohan Singh visited the flood hit state of Assam on Monday. Both Sonia Gandhi and Dr Singh made an aerial survey by helicopter of Majuli island, Jorhat, Sibsagar, Lakhimpur and Dhemaji districts, which were among the worst-affected in the floods. They also are set to survey the Kaziranga National Park, which has been completely submerged by flood waters. Earlier, the PM and Sonia Gandhi reached Jorhat’s Rowriah airport from New Delhi by a special flight at around 11:00 a.m.
For Congress President Sonia Gandhi politics is not power but a way to serve the people. The perfect example is her refusal of the post of Prime Minister when UPA was voted to power. “I always listen to the voice of my inner conscience. I have said on many occasions that my target is not the Prime Ministership. Today my inner conscience tells me to politely refuse the post” was the statement by the Congress President while turning down the post of Prime Minister. Further she had extended her full support to Manmohan Singh and that still continues. "During this time there were many political leaders who came to meet me to request me not to succumb to any pressure and appoint Mrs Gandhi as the prime minister, a request that would not have been Constitutionally tenable. If she had made any claim for herself I would have had no option but to appoint her," writes former President APJ Abdul Kalam in his latest book. But Sonia Gandhi chose not to become the PM and continued her efforts to serve the people maximum. Despite these realities some people like Dr Subramanian Swamy have been busy spreading rumours about Sonia Gandhi and her family. After the last revelation by Dr Kalam, the people in the country will understand the truth and ridicule the rubbish statements by the people like Swami. Sonia Gandhi is always concerned for the common man and welfare of aam aadmi has always been her mission. For Sonia Gandhi, the Congress President, politics is not power but a way to serve the people. That is what she proved when she refused the post of Prime Minister when UPA was voted to power. She was always concerned about the poor and underprivileged and the children. Their pain was her pain. When a massive earth quake jolted Jammu Kashmir, she took time to reach there without any delay to console the victims and extended all her help and support to help the affected people. She expressed her concern and pain when a drastic Tsunami hit Indian coastal areas. Her deep concern for the aggrieved was also seen during the flood in Gujarat, Maharashtra and Himachal and also during the terrorist attack in Delhi as well as when a number of farmers were hurt in a police firing in Rajasthan.